Hanami (Cherry blossom viewing) is one of most famous seasonal customs to enjoy Sakura (cherry blossoms) with food and drinks! The Japanese traditional customs were loved by people all over Japan!! 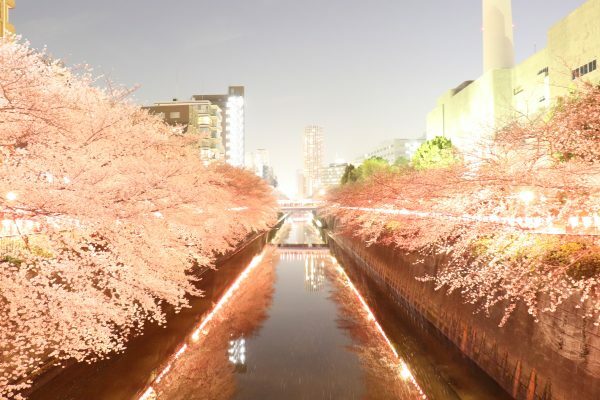 We describe the top 5 spots for Hanami in Tokyo in this article. 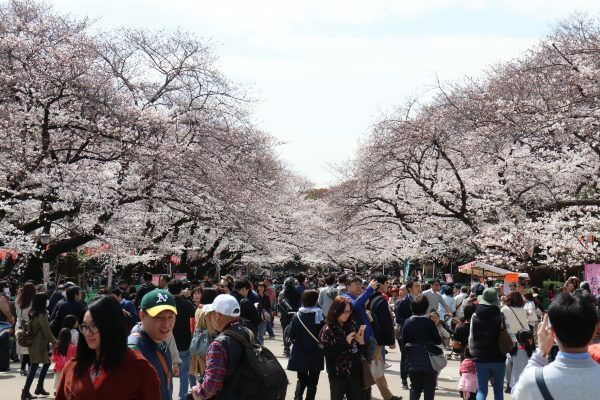 For Hanami spots, visitors should consider what kind of atmosphere you guys like to enjoy because some of place are very busy. We shows congestion for each places at the lists below. At first, please watch our video that describes top 5 Hanami spots in Tokyo!! 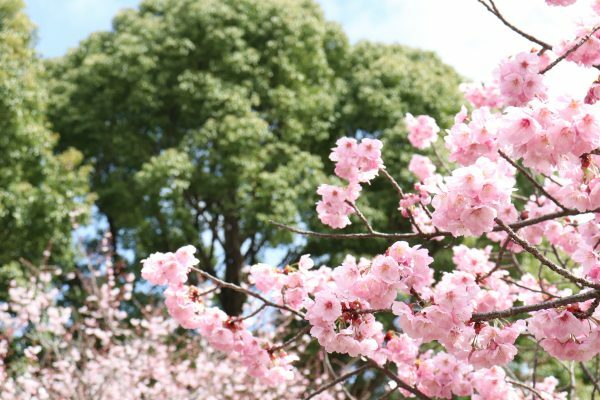 In 2018, first bloom in Tokyo is 17th March and full bloom (best viewing) time is 28th March. This year’s bloom time is little bit earlier than usual. Actually, there are some type of cherry trees in Japan but weather forecast focus on “Someiyoshino” as it accounts for approximately 70 percent of Sakura standing in Japan. The blooming period of cherry blossoms is different depending on the type. Focusing in Tokyo, the below are the top 5 famous spots for Hanami. This place is very recommendable for all of visitors as it contains large number of Sakura “1,300” cherry trees and the field is so wide. The atmosphere of the garden is very peaceful compering to other Sakura spots and children can play on the lawn safely. Visitors should bring own picnic blanket, foods and drinks to enjoy Hanami. 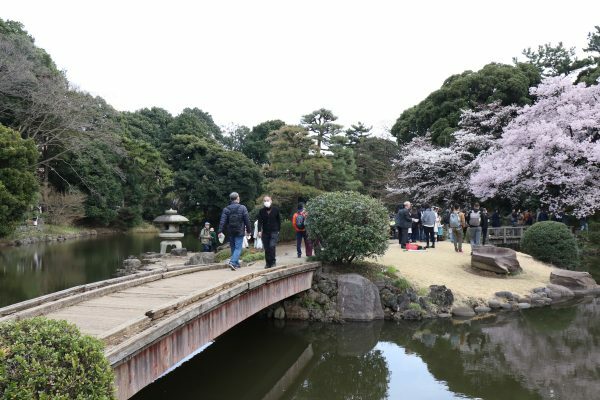 Not only Sakura, Shinjuku Gyoen has unique area such as Japanese garden, French Garden and English garden. Please check another article more detail about Shinjuku Gyoen. This place is very famous as cherry blossom viewing spot in Tokyo for all generation. 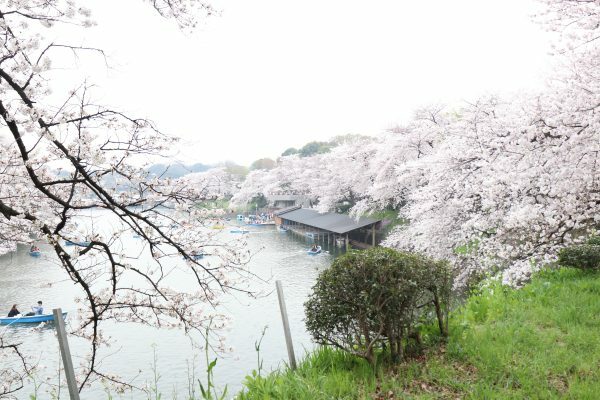 It has different viewing points compering to others… You can get on boat and able to see Sakura (Cherry blossoms) really up close, also cherry blossoms reflected in the water. However, there is an issue to watch it as it takes 1 – 2 hours in line to get on the boat… Please be sure it before making schedule to visit. The walking path is covered with Sakura of about 250 cherry trees for about 700meters. You can also enjoy food stands around the walking path. 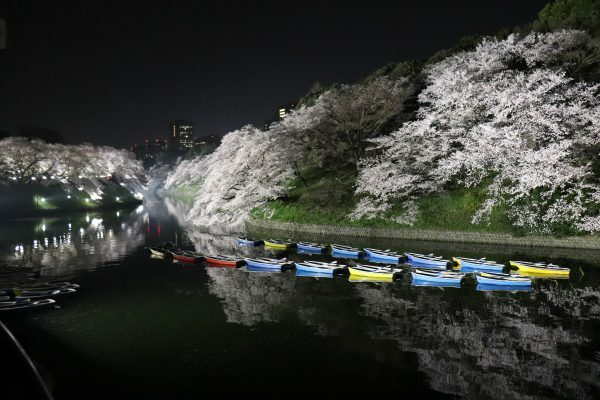 Night view of Chidorigafuchi’s cherry blossom is also recommended to see because the atmosphere is totally different!! There is no space to put your picnic blanket. Visitors should prepare to walk all days. This park does not contain a lot of cherry trees compering to other place, but massive people go to here to enjoy Hanami. Probably the reason is it’s area… The area of park is 540,529.00㎡!! This place is relatively quiet than other Hanami spots and visitors can come here with kids. You can bring your own blanket like people picture above. Visitors are able to enjoy food stands in Yoyogi park that offers foods and drinks. This park is close to Harajuku area where famous place as “Kawaii culture” (cute culture) and visitors also able to enjoy shopping and foods there. Also one of famous shrine “Meiji Jingu” is located next to yoyogi park. If you like loud place to enjoy drinking alcohol mainly under cherry trees, Ueno park would be best place!! Ueno park is one of most popular Hanami spots in Tokyo as very crowded place. 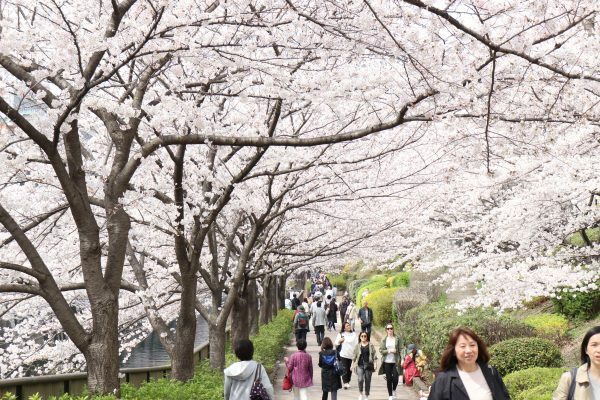 About 800 cherry trees are stand on central path and visitors conduct picnic around Sakura!! It is also recommended to bring own picnic blanket to do picnic. Around full bloom day, we recommend visitors to arrive there early to set your picnic blanket as there would be no space afternoon. Visitors are able to enjoy foods at food stands in Ueno Park such as Yakisoba (Japanese noodle), Takoyaki, also some sweets!! There is Ueno zoo on the ground of Ueno Park. Enjoy watching Panda!! Feature of this place is different with other spots. About 800 cherry trees stand on the side of Meguro River for several hundred meters. Actually, this spot is not appropriate for Hanami, but good for people who like to take a walk watching cherry trees. We recommend this spot for visitors who are going to visit Shibuya are where Hachiko and scramble crossing located or Ebisu area where Ebisu garden place located as it is close!! Also night time is very recommendable as the cherry trees are light up in the evening during Nakameguro Sakura Festival.